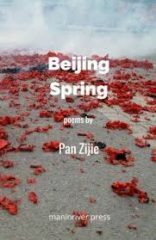 Shortly after I received a copy of Beijing Spring, in Melbourne, for reviewing, I got on my way to Canberra for a visit and read the book in one go on my flight there. Immediately, a number of things, quite suggestive absences, caught my attention: there are no blurbs on the back and no author biog, things that one reads before one plunges into poetry. Other things emerge, in the book, and, now, a few days after, from memory, without reference to the physical copy of the book and perhaps out of sequence, too: beginnings of lines or sentences that serve as high-lighted titles, some in larger font sizes than others; Beijing Spring, the title of the book, that reminds one of a similarly titled pro-democracy political magazine based in New York, known as《北京之春》（beijing’s spring）, and that is also a reference to the period of political liberalization in China in 1978 and 1979; retelling of stories in martial arts films; letters to an unknown recipient, or perhaps the poet himself, or, as suggested at Amazon online bookshop, ‘to a famous revolutionary poet’ (http://www.amazon.com/Beijing-Spring-Zijie-Pan/dp/0987473352/ref=sr_1_1?ie=UTF8&qid=1456873105&sr=8-1&keywords=beijing+spring%2C+pan+zijie ) from a ‘sister’; and travels around Beijing in a ute. And that left me smiling wryly, at this dream that doesn’t seem a dream but that remains a dream because it’s titled a ‘dream’. Quite a number of poems feel like that and it’s an interesting, endearing quality. There are other poems that I like, too, such as ‘She says it stinks’, ‘Pretty Girl’ and ‘Dear Brother’ (p. 65). One was left with an uncomfortable feeling, though, when one finished reading the book. Questions keep coming up: Why is the poet so unassuming, keeping such a low profile that it almost feels like the book was written by an anonymous person? Is there a deliberate statement being made through this anonymity and suppression of one’s own identity? Why did this reader feel an affinity with the poet and his book? I did my homework and found out about the poet. He was originally known as Zijie Ken Pan, born in 1956. Having published his first book of poetry, Vostok & This Could Have Happened to You in 2002, he did his PhD in creative writing in 2006 at Macquarie University, with his thesis titled, ‘Representations of Chinese men in Australian fiction 1973-2000: an analytical interpretation and a novella.’ A second book of poetry appeared in 2015, In Another Time. A number of poems were published in such diverse magazines and newspapers as Southerly and The Australian, though the poet’s name had changed from its anglicized version to the current Chinese pinyin version of Pan Zijie, the same way Leslie Zhao, Australian-Chinese short-story writer, on returning to China to become a playwright based in Shanghai more than a decade ago, reverted back to his original Chinese pinyin version of Zhao Chuan. It seems to me that the poet is engaging in a process of de-Australianization, or, to put it mildly, a process of resistance, of not wanting to be known as part of all that, of wanting to go it all alone no matter what, and of connecting to one’s past with one’s own stories or poem-stories that are being suppressed or suffer the risk of suppression in a country one is a migrant in. Can I also suggest that the press, Maninriver Press (Man in River Press? ), is also part of that process, being apparently, and proudly, run by Asian-Australians, or even migrants, something that I always admire and hope for as many of my books were published by migrant-run presses, such as Papyrus Publishing, Wild Peony and Brandl & Schlesinger, to name but a few? That the word ‘Australia’ is never mentioned once in the book adds to the impression that this is deliberate and, if that is so, the strategy works well. Again I think of Zhao Chuan who, in a number of meetings we had, hardly ever mentions Australia while his work is being shown around in other European countries such as Switzerland and England. While I looked in vain for the word ‘Australia’ in the book, I managed to find tropes evocative of the country, in lines like this, ‘to stay small harmless nations’ (p. 65), or this, ‘The winds come from the north. Always dry, in strong gusts pushing and bending trees’ (p. 60), and this, ‘Refugee may be a long way, some things will become burdens, a country, a home…’ (p. 56), ‘refugee’ being a subject Pan once wrote about in a poem, found here (http://www.sundresspublications.com/stirring/archives/v2/e2/panzk.htm ), although not a major concern in this collection. 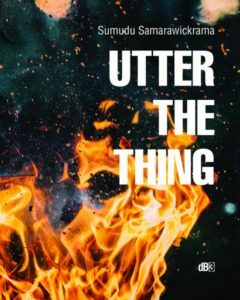 The major concern, to this writer, seems to be a preoccupation with the creation of the poet’s own mini-autobiographies; about ‘us little folk’ (p. 35), be they stories about ‘Beijing Metro’, in an eerie dreamlike situation where ‘He shows a photograph of five heroes. Himself as Zhu De…’ (p. 7); about ‘toads’ whose ‘venom’ is squeezed for ‘medicine’ (p. 11); about this ‘I’ who’d ‘get a job teaching English at the Beijing Language and Culture University’ (p. 14); about stories based on the martial arts (Wu Xia) films in which nothing is said but everything seems to have been said, another impression of mine; and about letters sent by Sister to ‘Dear Brother’ in a sequence of what is known in Chinese as tongti shi (poems written under the same title). And, last but not least is the interesting fact that Chinese words in pinyin share the same importance of English words by not being put in italics, thus not being made to look strange, such as ‘xiangchun’, ‘guqin’, ‘pipa’ and ‘siheyuan’ (p. 17), all immediately known to me, eliciting an instant smile on my face, though that may baffle the monolingual English-language speakers in this country and elsewhere. But who cares? A migrant is not a required explanation. He or she is, to borrow one word image from the book, an ‘invisible cloud’ (p. 57), that ‘drive(s) away the devils’ (p. 70). OUYANG YU has published over 55 books of poetry, fiction, non-fiction, literary translation and criticism in English and Chinese languages, including his award-winning novel,The Eastern Slope Chronicle (2002), his collection of poetry in English,The Kingsbury Tales (2008), his collection of Chinese poetry, Slow Motion(2009), his book of creative non-fiction, On the Smell of an Oily Rag: Speaking English, Thinking Chinese and Living Australian (2008), his second novel, The English Class (2010), his book of literary criticism,Chinese in Australian Fiction: 1888 1988 (2008), and his translation in Chinese, The Fatal Shore (forthcoming in 2011).